This is an exceptional offer of 40+ Russian Pin Badges to feature Vladimir Ilyich Lenin collected over time from various Soviet sources. 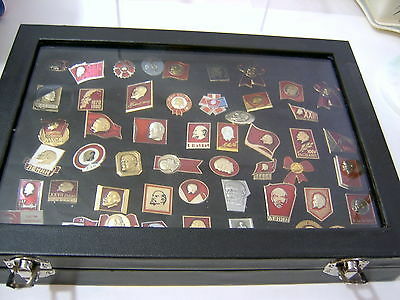 This offer comes complete with a substantial display case, as can be seen from the three pictures. The case measures 8 inches (20.5 cms) x 11 inches (28 cms) with a depth of 2 inches (5 cms). 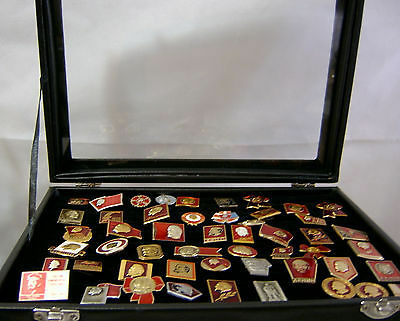 The pin badges are each in original condition and would vary in price from £3.00 to £5.00 if offered singly - see our listings for similarly-sized badges. 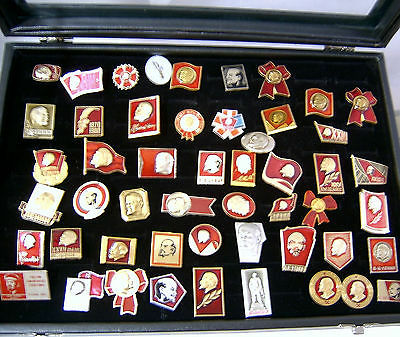 As far as I am aware none of the badges shown in the case are currently offered for sale as single items in my listings.